Hey guys, here's the first rough copy of my remake the Morrowind ending cutscene. Please note that the transition between the sky and the ashlands shot is meant to be a clear fade, but I kept getting weird blue and red lines in Sony Vegas, so I ended up making it a black fade, for now. Also, since we don't have an Azura model, I just made a temporary dark elf NPC... I know, but I can always re-record those scenes with an updated model. Some of the cinematics will also be redone because they are stand-ins. The movie looks good, but only the end of the movie stopped abrupt. Glad to see that things are finally starting to come together as a whole. Plenty of things to keep players busy in Skywind at present! awesome but annoyingly will need updating as we update environments. Have u saved the camera paths or video structure in anyway to save work? So how do wee need Azura to look? Yup, I have all of the shots sorted out and it will be easy to make another version. 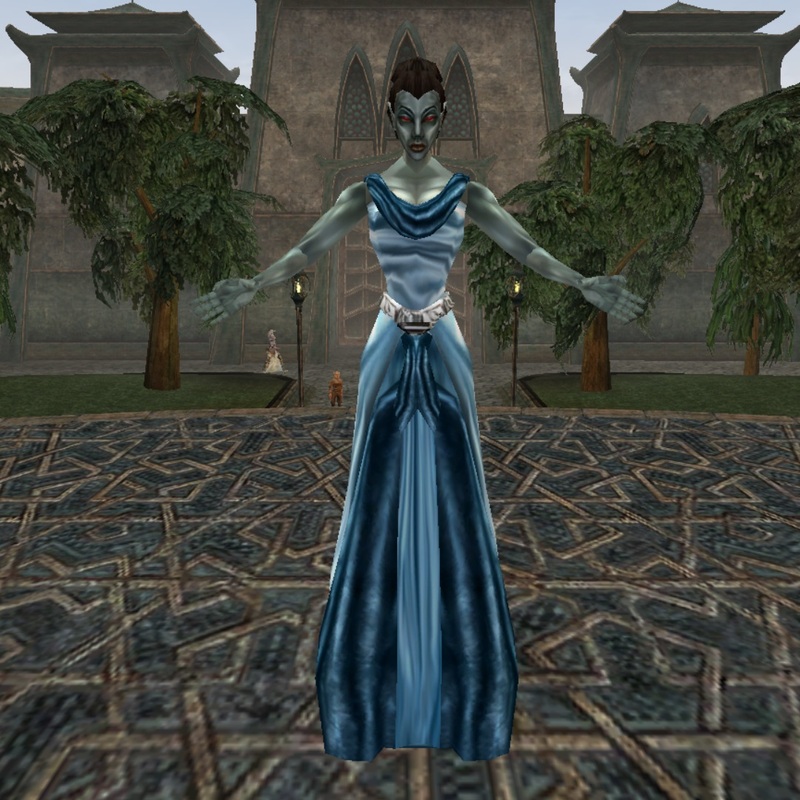 For Azura, hmm, well do the same as what happened with Dagoth Ur, just a much better, higher quality model - I guess. The dress needs to be more spectacular and ornate than the original, I think. Could take inspiration from her statue in skyrim. I vote for a mix between the dress seen in Tribunal and the dress seen on the statue on Skyrim. The hood kinda makes her seem more mysterious. 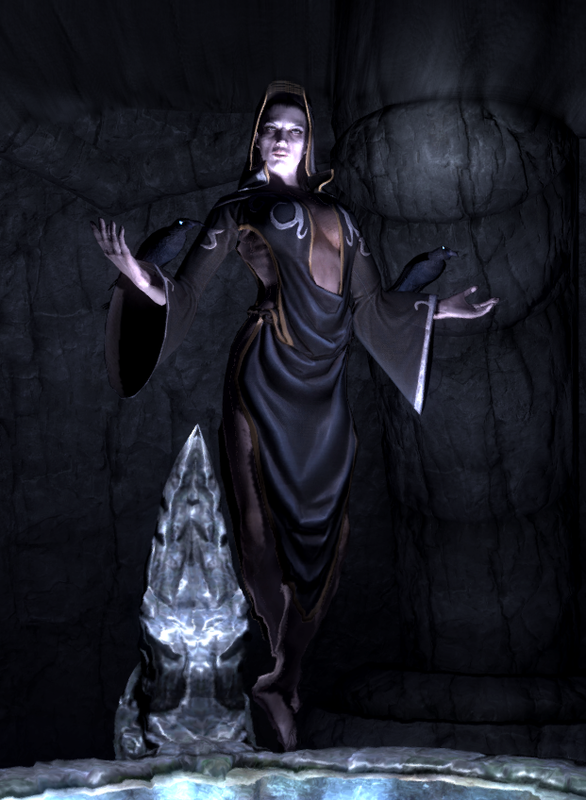 And you could use the animations from Nocturnal from Skyrim for when she actually shows up, as it resembles the pose she makes in Tribunal. Cool idea, download link has been added for in-game. I can't wait to see how Dagoth/Azura/Vivec will look too! Hm, I think it is a good moment to put our yesterday's idea into some thread. So, we were talking in the dev chat, just a speculation - but we agreed that it would be pretty awesome to change up a few things in Morrowind's main quest ending to make it more spectacular. So, my idea was that after we kill Dagoth Ur, we run away from falling Akula Khan. However, unlike in vanilla Morrowind, we would not make it. Some debree would fall on us, or a bridge would collapse under our feet and we'd black out and think we're dead. Then, we would wake up, having no HUD and inventory access, in Moonshadow - the realm of Azura. (I can work on the location design). While we walk a stone path through her godly gardens, seeing red roses in blue light, and silver structures against a sky full of stars, we'd reach her throne. There she would seat (I could design her looks and dress too), and give us that speech. In a little pond that would be placed before her throne, scenes from your cutscene would appear as she speaks, the Ghostfence, and all the others (so we'd basically watch the cutscene in her pond of fate). In the end, she'd give us the ring with the words "take this from the hands of a god". We'd black out again, wake up barely alive in the debree, thinking that it must've been a dream, but we would still have the ring. So, what do you think guys? Would all that be worth the effort? I would really think so, as some people are complaining about Morrowind ending being a bit underwhelming after all the work we'd have done. visually it would be worth it, but can it be coded such? I think most of it would be possible to code (see Sovngarde), I'm only not sure about the images in the pond. some people are complaining about Morrowind ending being a bit underwhelming after all the work we'd have done. That sounds really cool, and I thought for the knocked down animation we could use the one from Dragonborn when Miraak pushes you over and you see your hands on the ground. I absolutely love this idea! It always seemed odd to me that there was never any sort of divine intervention by Azura during the battle at the heart considering how powerful she is. The Neravarine fulfilling the prophecy and the Daedra saving her champion from his/her demise seem like a fitting climax for all the characters. Also this would be a great opportunity for some creative input by the modders to determine how Azura's realm could look.